The Mayor Of London, Boris Johnson, Plays Paintball In Surrey! On Sunday 10th July the esteemed Mayor of London Boris Johnson paid a visit to the Delta Force Paintball centre in Effingham, Surrey to celebrate his son’s 14th birthday. In keeping with his own environmentally friendly policies, the Mayor of London and his family arrived at nearby Effingham train station and proceeded to walk to the centre ready for a day of paintball action. From the moment he arrived at the centre until the moment he left Boris was turning heads, obliging photo opportunities and entertaining our staff with his paintball battle experiences. From everyone at Delta Force Paintball we would like to wish Boris’ son Milo a belated happy birthday and thank Boris Johnson, his family and friends for choosing to play paintball with Delta Force. Like any major leisure activity, paintball is a very competitive industry and the fact that such a big political name like Boris Johnson has selected to play paintball with Delta Force not once but twice is both an honour and a testament to the quality of service that Delta Force Paintball provides. 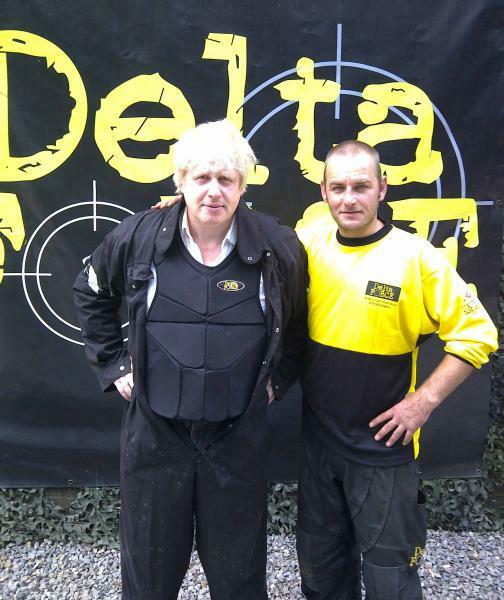 Boris has now joined an esteemed list of Delta Force Paintball celebrity enthusiasts who have enjoyed multiple paintball events with us. Some of the other familiar faces that have come back to Delta Force Paintball time and again include Prince William and Prince Harry, John Terry and the team at Chelsea FC and the boxing Brit Amir Khan.